There’s a lot of sky in Sutherland! It dominates the mountains instead of being crowded out by them, and is reflected in thousands of lochs and lochans. 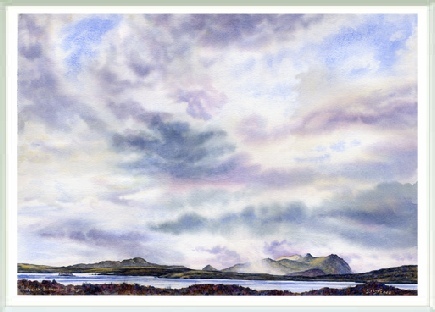 In this view from Clar-loch Mor on the Bettyhill-Tongue road, even the 2507ft “Queen of Scottish Mountains”, Ben Loyal, seems humbled by the overarching clouds. Whether pristine blue or swirling with cloud, milky with mist or glowing with the northern lights, the sky dominates the lives of people too. It can raise spirits or depress them; exhilarate or enervate. Such power to influence is remarkable given that the sky is really little more than the effect of invisible energy upon unseen particles! NC500 - See this view from the NC500 between Bettyhill and Tongue.